In six months, Shaun has changed the world. His internet presence changed from a discussion of living with pain and Fibromyalgia to news. Not just any news, but often alternative news that was unexpected and generally unknown. He diligently searched for the truth above all else with exhaustive research of various sites. Followers rewarded him with over 500,000 hits in those short six months. As the Scottish Referendum for Independence drew closer to election day, September 18, his love for his country and her people became more and more the focus of his blog. His voice became more and more the Scottish voice. Shaun understood the Scottish experience with empathy gained from his own searing, constant pain. He is a “bleeding heart” liberal concerned with people and their needs. . . . the poor, the elderly, the disabled who need housing, pensions, food , and medical care not Westminster’s austerity programs where the money is sifted to the war machine. Scots want the Trident Missiles moved out of their land so that they are no longer part of that culture. We learned all this from his posts as he connected with all who wrote him. Shaun, you were continually saying that “Everyone has a story. . . ” Thank you for sharing yours with the world and inspiring us. Your love for Dawn and your children, your love for the Celtic Football Club, and your love for Scotland are ever present in your writing. Thank you for teaching , cajoling, understanding others’ struggles, and your deep love of Scotland. I, for one, hope and expect that we will be able to read more from Shaun as Scotland works out the myriad of details in the next two years forming their new country. . . . . .
My husband and I were in Scotland for 5 days in 1996. 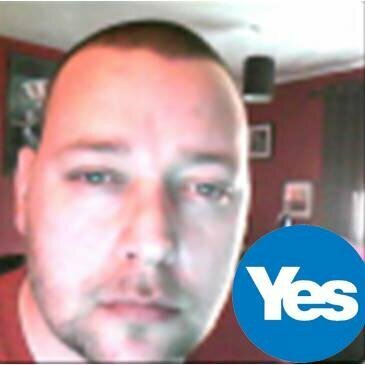 I remember a man in Callender who spoke so longingly about Scottish Independence. That was my beginning experience with Scotland’s dream of independence. It has taken over 300 years for this dream to become a reality. Scotland follow that dream and make it a reality. . . . . Vote YES on September 18th. Thank you Shaun Gibson for your heart of freedom! This entry was posted in Travel, Uncategorized and tagged 2014, freedom, Scotland, Scottish Independence, Scottish Referendum, Shaun Gibson, VOTE September 18, Vote Yes. Bookmark the permalink. I wish I could vote! Thanks so much for your kind words, Shaun ! Hope everything gets solved in your country. Best of luck! Great wish for Scotland, the free !